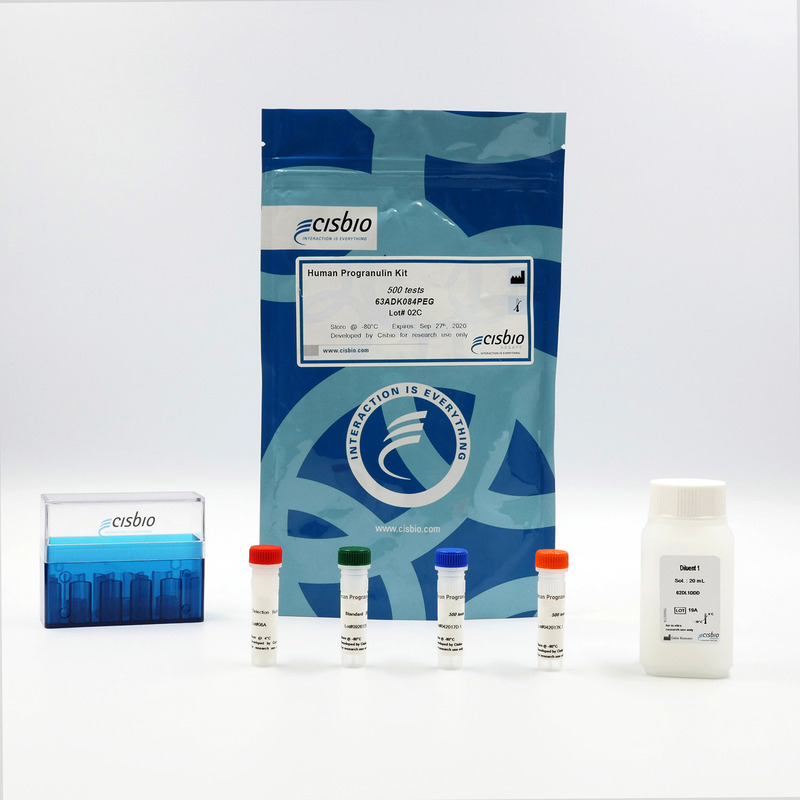 This HTRF kit is designed for the rapid detection of human Progranulin produced by cells. Progranulin, also called proepithelin or prostate cancer (PC) cell-derived growth factor, is the precursor protein of granulin. Progranulin is involved in Frontotemporal Lobar Degeneration (FTLD) and Alzheimer's Disease, where it may protect against beta amyloid toxicity. This cell-based HTRF assay ensures quick results and is adapted to functional screening of compounds using progranulin secreting cells. Human Progranulin is measured using a sandwich immunoassay involving two specific anti-human Progranulin antibodies, respectively labelled with Terbium Cryptate (donor) and d2 (acceptor). The intensity of the signal is proportional to the concentration of the Progranulin present in the sample. The simple Progranulin assay protocol, using a 384-well small volume white plate (20 µL final), is described on the right. Cell supernatant, sample, or standard is dispensed directly into the assay plate for the detection of human Progranulin. The antibodies labelled with HTRF donor and acceptor may be pre-mixed and added in a single dispensing step to further streamline the assay procedure. The assay can be run in 96- to 384-well plates by simply resizing each addition volume proportionally.